We’ve updated some of our recommended amplifiers for 2019. We have replaced one of our newer picks after some interesting reader feedback regarding the amplifier’s manufacturer, suggesting that it still had some customer service issues to work out. Hearing amplifiers and personal sound amplifier products (PSAP) can be helpful for people with mild to moderate hearing loss who need a bit of assistance hearing the TV, conversations, or when in a noisy situation like a restaurant. They can often work well as an inexpensive, over-the-counter alternative to a hearing aid that you can get without a prescription and without visiting a hearing clinic. There are all kinds of different styles of personal sound devices to choose from, including those that look and function just like a hearing aid or handheld designs that come with headphones that are easy to operate and use. Whatever your hearing loss needs, we have compiled a list of the best selling and best quality hearing amplifiers that are available. 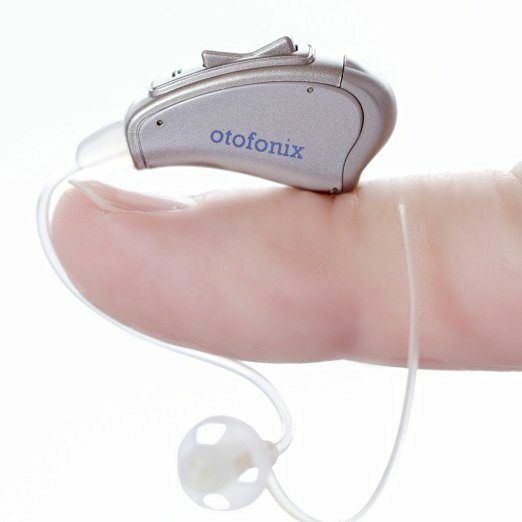 The Otofonix Elite Personal Sound Amplifier is another very popular BTE style of hearing device. The Otofonix has the same type of features as its similarly priced competitors. It has 4 channels, a digital sound processor and background noise reduction. It also has a rocker switch, so it is straightforward to use, as well as allowing for some customization to help you get the right sound for you. Despite the manufacturers annoyingly frequent name changes on this product, the Empower Wave remains one of the best high-end, behind the ear amplifiers that you can buy. 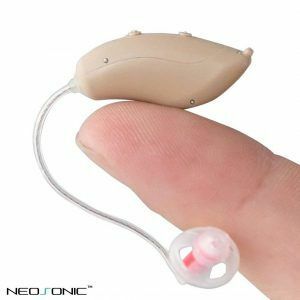 It is an extremely popular model that a lot of people with hearing loss have had success using. It is a high-quality product that can help people with mild to moderate hearing loss hear better in various situations at an affordable price. It offers a lot of the same types of features and components that some of the top brand traditional hearing aids do, including having four different amplification programs which are suitable for a wide range of hearing amplification needs. 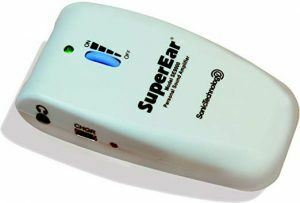 It is a useful device for many kinds of hearing loss. The Pocketalker Ultra 2.0 is the latest model of the very popular Pocketalker device that is used widely in nursing homes and long term care facilities. 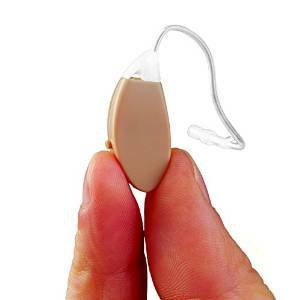 It is an excellent device for those who have difficulty using smaller hearing aid style designs. It is a hand-held style that comes with headphones, so it works well for those people who don’t like to wear in-ear devices or who just need a boost when wearing their hearing aids. 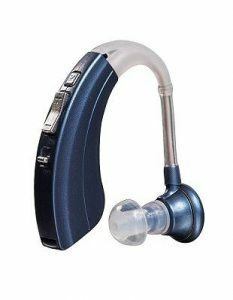 This model has a built-in telecoil so you can use it with telecoil-equipped hearing aids or in ADA-compliant venues. The update to this version of the Pocketalker is that it now has an adjustable tone and new balance control. The Pocketalker Ultra 2.0 is comfortable for anyone to use, all you need to do is point the microphone near what you want to hear, put on the headphones and then you will be able to hear more clearly. The Banglijian Hearing Amplifier Rechargeable Ziv-201 has emerged in the last couple of years as one of the best, good quality, budget options. It is a behind the ear style, that is rechargeable, so you will be able to save money by not having to buy batteries. There aren’t a lot of decent rechargeable options, so if you would rather not have to purchase batteries, this is a great model to check out. The Ziv-201 is designed for people with mild to moderate hearing loss (hearing loss level from 25-70 db). It retails for approximately $150. One of the cheapest, yet most effective products for the price is the Britzgo BHA-220. It sells for around $60, but many people find that they are getting pretty good improvement on their hearing from this device. The features are pretty basic: 4 different frequency modes, an on/off button and volume control and you can wear it in either ear. The device itself is lightweight, and most people find it comfortable to wear. 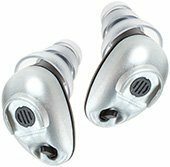 Etymotic’s The Bean QSA is an in-ear design that is one of the older models that has been around for several years now. The in-ear style of an amplifier is much less common than the behind the ear style. The company behind this device is called Etymotic Research, and they have a 30-year history in auditory research, hearing loss prevention, high-fidelity hearing aid circuitry, and consumer electronics. The Bean comes in two models, the Bean and the T-coil Bean; if you are interested in the Bean, you should be aware of the difference between the two models. Two standout features on this design are the high quality of the high-frequency amplification and the built-in sensor that automatically adjusts to the surrounding noise level. There are a lot of cheap, terrible quality hearing amplifiers that are available that a lot of people buy then are very disappointed with the results, or lack of results. One handheld style that is inexpensive, but not terrible quality is the Super Ear SE5000. It is easy to use, comfortable to wear for those who don’t like traditional in-ear or behind the ear styles. It works best for mild to moderate hearing loss and can be especially useful in hospitals, nursing facilities, churches and most situations where you need a bit of a hearing boost. Hearing amplifiers, also known as personal sound amplifier products (PSAP), are wearable electronic products that are intended to amplify sounds for people who have mild to moderate hearing loss and need extra hearing support. PSAPs are not considered hearing aids, although a large number of people use personal sound amplifiers as a much cheaper alternative to hearing aids. 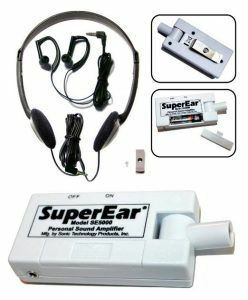 There is a wide range of different models of personal hearing amplifiers made by various manufacturers that use different types of technology and personalization to enhance hearing. You can use hearing amplifiers for television watching, to hear conversations better, while hunting, and while at a movie or church, etc. 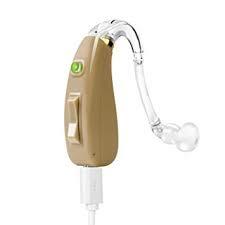 They are often designed to look like hearing aids, but you can also buy models that look like Bluetooth phone devices or hand-held devices with headphones. How is a Hearing Amplifier Different than a Hearing Aid? There is a lot of confusion over what makes a make a personal sound amplifier different from a hearing aid. Hearing aids and the behind the ear and in-ear styles of hearing amplifiers are both small, electronic devices that fit into the ear and amplify sound. They both use similar technology, although PSAPs are not regulated by the FDA in the same way that hearing aids are, and so do not require a medical prescription or a professional fitting. Hearing amplifiers are much less expensive than hearing aids, they range in price from $40 to $400, while hearing aids can range in price from $1000 to $7000. The quality of higher end models of the PSAPs is pretty similar to some of the lower cost hearing aids that are available. Currently, PSAPs are not regulated by the FDA in the same way that hearing aids are. Recently the U.S government passed the Over-the-Counter Hearing Aid Act of 2017 that will allow greater public accessibility and affordability with over-the-counter (OTC) hearing aids that are aimed towards people with mild to moderate hearing loss. It will take a few years for the FDA to come up with a definition for what is considered an OTC hearing aid, but it is highly likely that the current high-end PSAP, some of which we list above, will fall into the new OTC hearing aid category. Generally, hearing amplifiers do not perform as well as hearing aids. These devices are often marketed to people who aren’t ready to get a hearing aid, or who have trouble understanding what is being said in particular situations. They can also be useful for people who might be without their hearing aid temporarily or for people who are unable to use a hearing aid. Hearing professionals are generally very critical of personal sound amplifiers, but that may start to change as a new generation of technologically advanced PSAP’s become available. Some of these new devices use the latest wireless technology and come with software that lets consumers program the device themselves by downloading an app that enables you to customize the sound to your personal preference. The quality of hearing amplifiers varies quite a bit, so if you are interested in one of these devices as an alternative to a hearing aid, you may want to skip some of the low-end products. Also, be sure that whatever product you are looking at has a good warranty and excellent customer support. Before you purchase a personal amplifier, you should know about the features that you will need. 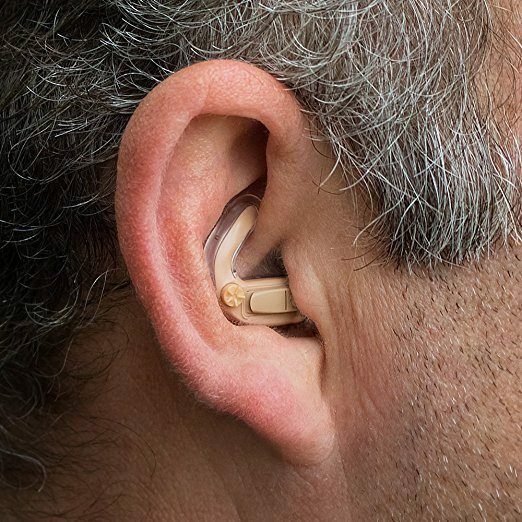 Some of the higher-cost products have technology similar to that in hearing aids like multiple channels for different noise environments, noise cancellation features, the ability to adjust audio signals, and directional microphones. If you are looking for something to help you watch TV, or help with hearing conversations, most basic PSAP will give you what you need, for lower-end devices pay attention to whether it uses a charger or batteries. If it is rechargeable, find out how long the charge will last. If it takes batteries, remember to keep the cost of the batteries in mind when thinking about the budget. For serious sound quality, you will want to look at some of the latest advances in technology from companies like Williams Sound, Bellman, and Symfon, or some of the newer startups like iHear Max. These companies are constantly updating their technology and offer some of the latest and greatest features on the market. Most hearing amplifiers are very similar in appearance to hearing aids that fit behind the ear with a piece that is placed into the canal. You can also get models that are hand-held with a microphone and headphones, or a design that looks similar to a Bluetooth device that people use with cell phones. When you are considering the different design styles, think about how often you are wearing it, when will you be wearing it, and how inconspicuous you want it to be. You may be wearing the device all day and forget that you are wearing it. Or you might want it only for noisy situations where you need a bit of help hearing what others are saying. Since most people use hearing amplifiers as a substitute for a hearing aid, the typical behind the ear hearing aid style is the most common and has the most number of models to choose from. The most popular type of personal sound amplifier is the behind the ear style. They are designed to look like a hearing aid and function in much the same way a hearing aid would do. There is a vast range of these types of amplifiers available from very cheap (less than $10) to styles that use the latest technology that can cost hundreds of dollars. As with most things, you get what you pay for, so the amplifiers that are less than $50 don’t tend to work very well. If you are looking at a lower cost amplifier, pay close attention to the reviews, as a lot of the cheaper models are inferior quality. PROS: Extremely portable and often small enough to be hidden behind the ear; minimal investment for budget models. CONS: Sound quality varies according to cost. Top Picks: See the best behind the ear personal hearing amplifiers. An in the ear design, obviously, means that it is a device that you put directly into your ear. 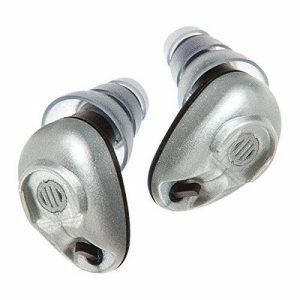 For the most part, in-ear models are hard to see and can give you a good level of amplification for a reasonable price while also having the same general features as the over the ear style. There aren’t as many in-ear amplifiers to choose from as behind the ear. PROS: Is more comfortable for people who wear glasses. CONS: They may be uncomfortable or may not fit in some ears. Body-worn or hand-held amplifiers like the very popular Williams Sound Pocketalker can help you hear what other people are saying in one-on-one conversations or small group settings. Most of these personal amplifiers come with earphones or headphones for people without hearing aids or have a neck loop for hearing aid users to listen through their hearing aids. PROS: Extremely portable and often small enough to fit into a pocket, easy to take on and off the earphones when needed. Key Features: External volume & tone controls, removable microphone with an extension cord. Key Accessories: Swivel Microphone, TV listening cord, belt clip. Top Picks: See the Best Hand-Held Personal Hearing Amplifiers. Personal sound amplifiers come in a wide range of prices from under $10 up to $400. The cost of a hearing aid can run from $1000 to $6000 per ear or aid, so hearing amplifiers (even ones that cost $400) look like a bargain in comparison to a hearing aid. Inexpensive devices such as the SuperEar 5000 will give you amplification, minimize background noise, and give you the ability to wear it discreetly for under $50. You should be wary of the quality and usefulness of the products that fall under $50. The adage ‘you get what you pay’ for is particularly relevant for these low-cost devices, so be aware you may end up with something that doesn’t work well. If you do purchase any of these devices make sure it comes with a money back guarantee. The overall quality of the devices that fall into this price category is slightly better than the lower priced models. The $60 Britzgo BHA-220 gives adjustable sound and multiple ear pieces to try to get the right fit. There are a lot of models in this price range that offer digital voice recognition with decent battery life as well as a money back guarantee. Features can be a toss-up in this price category, so you will have to do more research than with others before buying. 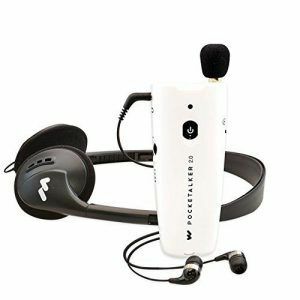 The William Sound Pocketalker falls into this price range, giving you a lot of great features like sound amplification and reduced background noise. It has a lightweight design for portability and is easy to use. It also has a solid volume control that lets you adjust your listening to different situations. A behind the ear model that has been selling well over the last year that is worth taking a look at is the Banglijian Hearing Amplifier Ziv-201. It is a rechargeable model that costs just over $100. In this price bracket, options range from behind-the-ear models life the Empower Personal Sound Amplifier for $349 to the to in-ear models such as Etymotic Research Bean ($375 and more), that amplify hard-to-hear sounds, including soft voices, while lowering the volume on loud noises. Sound World Solutions CS50 is also in this price range. 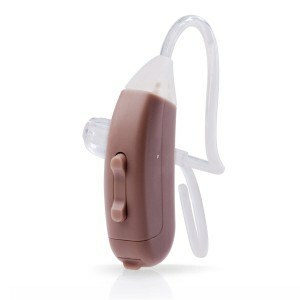 The devices in this price range are as close as you are going to get to a hearing aid without visiting an audiologist. Lower end behind the ear hearing amplifiers can easily be bought over-the-counter at your local drug store or somewhere like Walmart. Best Buy sells a few amplifiers like the Williams Sound Pocketalkers. You can also get all of these devices listed above through online retailers like Amazon, or in some case directly from the manufacturer. How do hearing amplifiers work with cell phones? Most amplifiers work in the same way with a cell phone as a hearing aid. Generally, you may have to turn the volume on your device up or down, but you shouldn’t get any feedback or static. I have small/large ears, will a personal sound amplifier be able to fit me? Most of the mid to high quality amplifying devices will offer different sizes of earpieces to ensure that you get the right fit. The right fit plays a huge part in how the product will work, so it is essential that the device fits properly. If you don’t like the idea of having your ear canal blocked by the amplifier, you may want to consider some of the hand-held devices that let you wear headphones. How long can you wear the BTE and in-ear amplifiers? The length of time varies between different products; it is generally recommended that you don’t wear amplifiers for longer than 6-8 hours, although many users wear them from when they get up to when they go to bed. Do you have to buy a pair for both ears or can you just buy one for one ear? It depends on what your hearing loss situation is. If you cannot hear at all out of one ear and only a little bit out of the other, then you can just purchase one for the ear that you can listen from. If you have hearing loss in both ears, then you should get a pair of amplifiers. If you have one ear that you can hear well out of and one ear that has some hearing loss, you should be fine just getting one amplifier for the ear with hearing loss. Can you customize the amplifiers to hear high or low-frequency sounds? For budget models, you won’t be able to change the setting between different frequencies. If you look at some of the higher priced amplifiers, they do offer a range of settings (often 4) between low and high, where you need different frequencies. Can you wear the behind the ear amplifiers with glasses? You can usually wear most amplifiers with glasses, although it may be a little bit uncomfortable and may take some fiddling around with the positioning of the glasses. Do any of the amplifiers come with a telecoil to use with hearing loops and landline phones? Generally no, you won’t find a telecoil with most of the amplifiers (even the expensive one), although there are a couple of models that do have a telecoil. The Etymotic QSA Personal Sound Amplifier, The Pocketalker 2.0 and the Bellman Maxi all have telecoils or t-coil receivers. Are amplifiers covered by insurance? For the most part, no, they are not. Although check with your insurance company. How do I know if an amplifier will help with my type of hearing loss? Personal sound amplifiers work best if your hearing loss is mild to moderate. If your hearing loss is severe, you may find that amplifiers are not the best option for you. The general idea of these types of devices is that they amplify all the sound around you. Some of the higher end devices let you customize tone and frequency, and have noise reduction technology to help you get the best sound quality possible. Most of the higher end amplifiers have pretty good return policies as well, so you can try out the device and if you find it isn’t right for your type of hearing loss you can return it. Warranty– As mentioned above, since there is a good chance that a hearing amplifier may not work for your kind of hearing loss, it is crucial that you are aware of what any devices return policy is in case you need to use it. Battery Life– The battery life of the amplifier is also worth paying attention to. For most BTE devices you generally use a hearing aid type battery that should last around 5-7 days. There are a few rechargeable battery options. If you are looking for a hand-held device, you should be able to get much better battery life. Quality– There are many inexpensive hearing amplifiers available that on the surface look very similar to the devices that cost in the $200-400 range. If you are wondering why there is such a difference in price, the higher end models generally offer the option to choose different frequencies, give you better amplification, and more advanced technology (similar to hearing aids). They also have higher quality line receivers which should mean you have less feedback and background noise giving you better sound quality.